I learned to bake these shortbread biscuits on my first day at a disconcertingly posh cooking school that I attended, where the other girls all had nicknames like Bunny and – no word of a lie – Bugs. The recipe was invented, I believe, to use up scraps of cheese, and that’s most usually when I find it comes in handy. 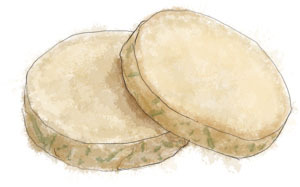 The biscuits are great dipped into bowls of hot soup, or spread with cream cheese, or as part of a ploughman’s, with (more) cheese, pate, chutney and celery slices. They form the basis of so many perfect autumnal lunches, and they can be frozen wrapped in saran wrap (cling film) so they can be baked fresh whenever the need arises. This recipe originally appeared along with a story of love found on a park bench. Thank you, it’s a wonderful story, and I plan to bake the biscuits with the children I am teaching in my not-as-posh but still lovely cooking school. I think the children will love them, and I intend to offer them the choice of tinkering too! I really hope you enjoy baking them – it’s a great way to use up bits and bobs.